Tom Kah Gai is a traditional Thai soup. Chopped chicken thighs and shiitake mushrooms swim in a flavorful broth perfumed by ginger, shallots, lime, lemongrass and chile peppers. Deeply aromatic, its flavors offer a beautiful combination of sweet, salty and sour that’s spiked with just a little bit of heat. You can top it with a handful of fresh herbs like cilantro and Thai basil which give the soup a wonderful, vibrant green punch. We serve ours as a light meal, topped with a squeeze of lime, and accompanied by a bowl of steamed jasmine rice. I often serve sliced mangoes or cultured coconut mango popsicles for dessert. Tom Kha Gai is one of several of my family’s favorite recipes – those featuring wholesome, homemade broth and stock which serve as the foundation for traditional foods around the globe. 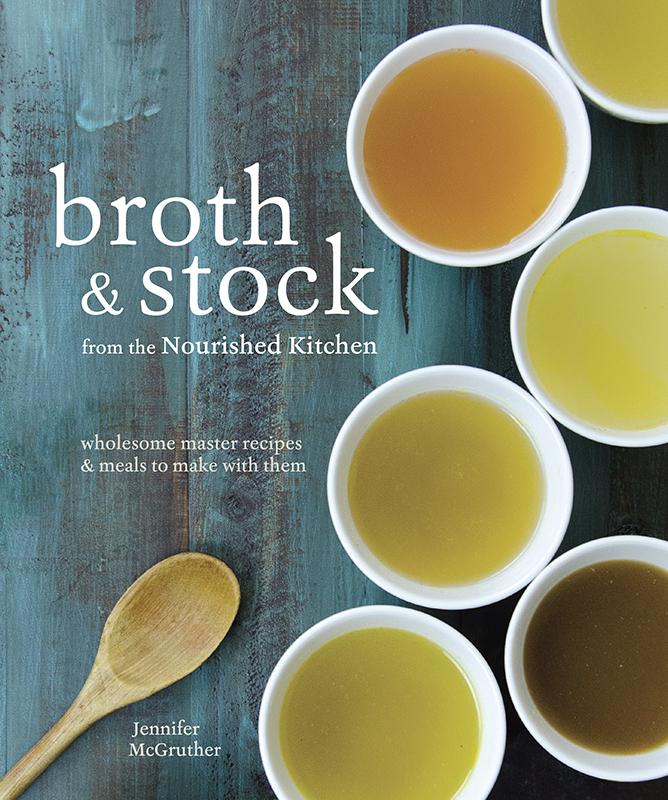 My newest cookbook, Broth and Stock (available from Amazon, Barnes and Noble and through your local bookseller), focuses not only on wholesome, protein-rich bone, meat and vegetable broths – but also simple, approachable recipes that can help you to incorporate them into your family’s everyday meals. The interplay of sweet, salty, and sour comes together in Tom Kha Gai, a flavorful Thai soup that's perfumed by lemongrass and spiked with hot peppers. This recipe is featured in my new cookbook - Broth and Stock which is published by Ten Speed Press and available through Amazon, Barnes and Noble and your local bookseller. 1 (13.5-ounce) can full-fat coconut milk (Find coconut milk in BPA-free cans here or make it yourself). Pour the stock into a large saucepan and bring it to a simmer over medium heat. Toss shiitake stems, chiles, lemongrass, ginger peelings, shallot skins and lime leaves into the simmering broth. Cover the saucepan, and let the aromatics infuse the broth with their flavors about twenty minutes. Turn off the heat and strain the broth into a pitcher or jar through a fine-mesh sieve, discarding the solids. Wipe the saucepan clean with a kitchen towel to remove any stray debris. Return the flavored broth to the saucepan and then add mushroom caps, sliced ginger, and shallots. Spoon in the chopped chicken thighs. Stir the coconut milk, fish sauce, and palm sugar into the broth and simmer over medium heat until the vegetables soften and the chicken cooks through, turning an opaque white, about twenty-five minutes. Ladle into soup bowls, garnish with sprigs of cilantro and Thai basil and serve with lime wedges alongside. In Thai, ‘kha’ means galangal, or blue ginger. It is *the defining ingredient* in tom kha gai, so please use that instead of regular ginger if you can! Not hard to find in Asian supermarkets these days. Also, lime leaves have a completely different flavor profile from lime juice. Omitting galangal and lime leaves will result in a perfectly acceptable and tasty dish, but it won’t be quite like a proper Thai tom kha gai. I’m not against substitutions, but for the sake of education, it should be made clear what’s what. Let’s call it: making informed substitutions 🙂 Another thing usually done in Asia: throw in cilantro roots + stalks when simmering stock. The roots have an incredible amount of flavor. Pity this is hard to find here — got to grow your own! Thanks so much for this info. Love authentic info. You are 100% correct. Thank you for helping educate people about how truly real Thai food is made. The free recipe for the Thai Style chicken is not coming up. I clicked the link for the recipe but only the pic showed up. ??? Sometimes the internet can be a little tricky, but I promise you that if you can interact with the page enough to leave a comment, you can certainly see the recipe. Just scroll up from the comments, or down from the top of the post. Absolutely beautiful recipe, thanks so much, it is just starting to get a bit cooler in our part of the world ( Queensland, Australia)and this recipe will be ideal to warm our toes. I bought your recipe book (nourished kitchen) for my birthday earlier this month and am truly loving it. I’m so glad you like it, Fiona! I’ve heard great things about Queensland. I can’t seem to bring up the recipe either. Hi Aryn, when browsing from your mobile, remember to click “read more” so you don’t accidentally skip the recipe. I think that’ll do the trick. Ah, okay – it seemed once I had left a comment the recipe became visible! Hi Cynthia, when browsing from your mobile, remember to click “read more” so you don’t accidentally skip the recipe. Just ordered both your books ….have been a long time follower. Fabulous recipes…but….I am Australian and we work in the metric system for measurements/weights and I always have to convert the recipes. Since you are internationally known now would it be possible to give metric as well as imperial recipes. Hi Cara! Thanks for the feedback. That’s something I might consider in the future as we go through and revise recipes. LOTS of Australians in the readership. I’d love to visit someday. Hi Peggy! I just updated the link – sometimes they get changed on us after we’ve linked to them.